These engines were open crankcase, hit & miss or throttle governed, Wico "EK" magneto, and had solid flywheels with five round holes. Although some of these parts may interchange with some other 'K' models DO NOT use this list for the 1-1/2HP model with the fuel tank bolted on to the carb with four screws. 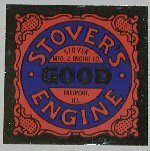 We have parts for the 2 & 3HP but "pickins are slim" for the 1-1/2HP and older style Stovers. The 'CT' models look similar to the 'KA' except they have an enclosed crankcase. The serial number tag may make it easy by having the model on it, or it may just have a TA in front of the serial number as the Stover "Economy" (Sold by Sears-three teardrop holes in flywheel). You don't need a tag to correctly identify these engines. Just give us the part # off the head, block, or back side of the flywheels. It may be helpful to tell us if your engine is hit and miss or throttle governed. All CT's used the Wico 'EK' magneto and we have all the related parts for the trip assembly including the trip finger bracket (on exhaust push rod). Good part's books and a good supply of new and used parts make it likely that we can help with your restoration. Some exhaust rocker arms and CT-4 parts have been "slim pickins" however.